Sometimes after strip surgery you may or may not see variations of hairs growing in skewed angles above and below the linear scar. It may be relatively subtle or very obvious. No real potential for increased transection w/ strip, unless the surgeon cuts directly into the oddly oriented region; Dr. Cole avoids transection in regular areas by aligning the device for extraction to the emergence angle of the hairs. 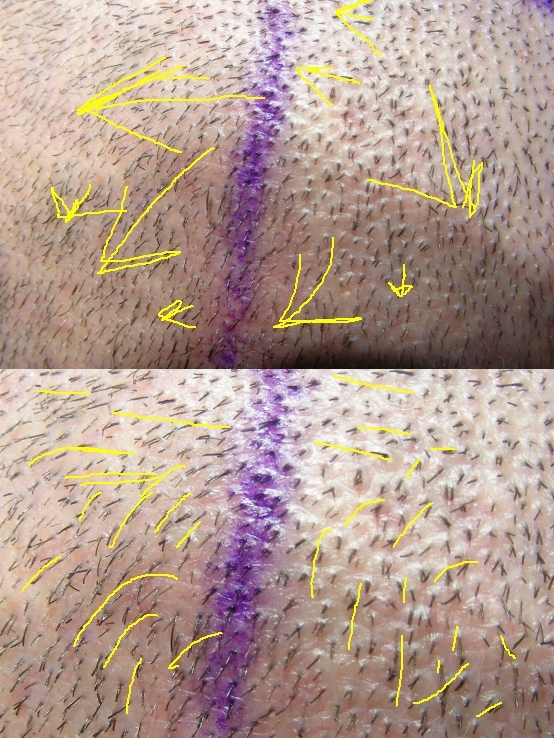 In these cases, the angles of the hairs are not uniform enough to avoid higher transection rates with strip. In the photos below, you may or may not see the different orientations of each follicular unit. 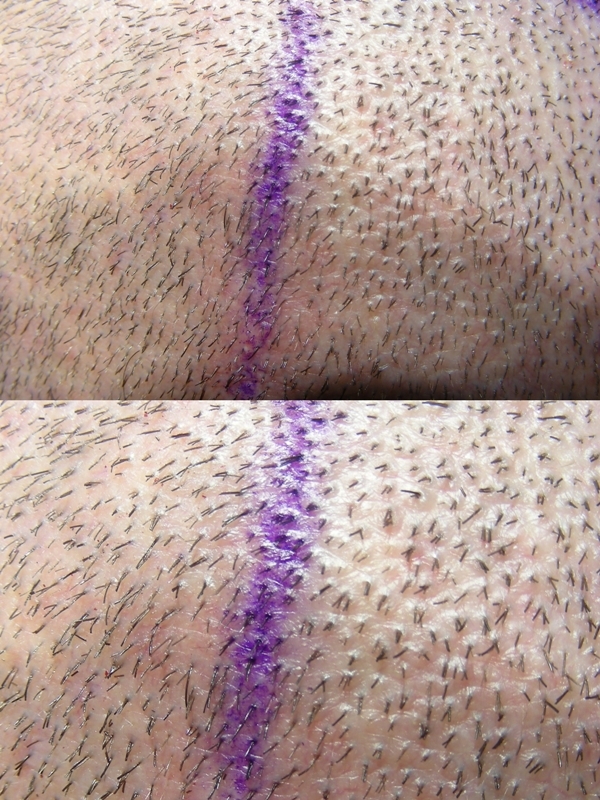 Usually each region in most patients’ donor areas has hairs growing in about the same angle. Usually a crown will have the uniformed whorl pattern with variations of different angles of growth, but these particular photos actually show the left side of a patient’s donor area (left occipital region). Some viewer may understand that some physicians actually refer to certain clinics as performing a “blind surgery”. In CIT, this is not the case at all. Dr. Cole will carefully examine the area under magnification to make every adjustment to instrumentation in order to meet the demands in a donor area. This process will afford the patient with a consistent result in the end. » transection rates with strip. » area (left occipital region). This patient would be a horror patient for FUE practisionars with limited experience. However for those who perform FUE on a daily basis this situation has been mastered and will not be a cause of problems. » situation has been mastered and will not be a cause of problems. Thanks for sharing the informative info. Do you suppose it takes longer to harvest this donor area? » » situation has been mastered and will not be a cause of problems. » to harvest this donor area? No Problem. I’m here to provide informative information regardng hair restoration that usually include patients’ results. I can honestly say that our clinic has multiple approaches to harvesting each patients’ donor area. These photos show how much of a risk there is if a surgeon uses only one approach with only one device. CIT isn’t performed blindly so our transection rate is about 2% made possible by a variety of instruments.